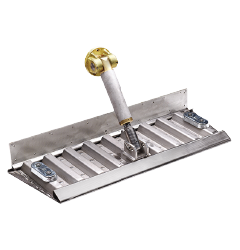 Control stability and enhance maneuverability in all conditions with Twin Disc boat trim tabs. Combine corrosion-resistant stainless steel systems or aluminum systems with four hydraulic kits and an array of accessories to meet your specific application. Series MY3000, MY4000 and MY5000 are available in simple tab (single plate) type for smaller boats and lower loads, and the reinforced tab (reinforced plate) for bigger applications. MY3000 series tabs feature a welded connection cylinder.